Miami’s greatest challenges may lie in not only trying to slow down (and wear down) the confident Beavers, but also to get pucks by sophomore Matt Dalton. Dalton allowed just two goals in the Midwest Regional and stopped a combined 59 of 61 shots he faced. This team’s strength is its balance. That depth makes it difficult for opposing coaches to match lines, and it’s tough to wear them down. Also, Miami is traditionally one of the best penalty-killing teams in the country – the RedHawks enter the Frozen Four ranked second nationally in that category. If your opponent is deeper than you five on five and wins 90 percent of its penalty kills, you’re in for a long night. 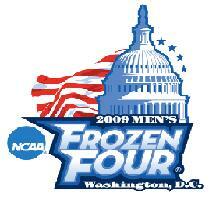 Also…there will be PLENTY of viewing parties nationwide, for those unable to make the trip to our Nation’s Capital. To see the official list (everywhere from San Fransisco to Atlanta) click here. Finally…a pointless reminder. The game will be broadcast on ESPN2 at 5pm on Thurdsay and it’s being brought to you with an All-Star lineup. Gary Thorne and Barry Melrose, along with Clay Matvik will have the call on “The Deuce.” It will also be broadcast locally, on 1450 WMOH-AM, with yet another All-Star lineup. Greg Waddell will handle the play-by-play duties and as an added bonus, “Diamond” Dave Allen will accompany Waddell, providing color commentary. It’s an All-Star lineup for an “all-star” kinda’ weekend. I will be in Washington, so I’m not sure what coverage on the blog will be like at this point. I’ll also be updating on twitter.com/muhockeyblog and additionally, for WLWT.com in some capacity. More on that as the logistics are worked out. Posted on April 7, 2009, in Uncategorized. Bookmark the permalink. Leave a comment.